If you’re looking to give your fitness regime a bit of a shakeup then it’s time that you seriously considered investing in a weighted vest. But with so many available on the market, how to you find the best weighted vest for you? And how do you know if they’re right for you in the first place? 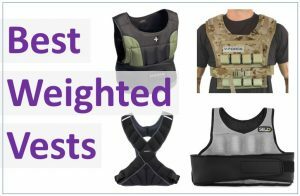 What are weighted vests for? As the name indicates, a weighted vest is literally a wearable vest which has weights built into it. Sometimes these are metal weights built into padding, sometimes the weight is provided by pockets of sand, but, either way, they’re a highly popular choice among athletes of all abilities when it comes to pushing your workout that little bit further. 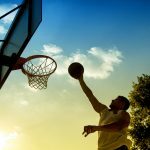 Weighted vests can easily become part of your home exercise equipment, but, if you’re reading this article, there’s a good chance that you’ve got very little knowledge about how they work and the benefits they provide. And that’s why we’re going to take a look at how they can bring a whole new challenge to your workouts and before diving into the best weighted vests on offer. Increased strength in lower body – By putting an increased load on the upper body – such as with a weighted vest – and then having to exercise with this in tow, your legs are going to have to work harder to move this additional weight. And this can increase leg strength by up to 30%. Helps you to burn more calories – When you’re exercising at a high intensity, you burn more calories. It’s a pretty simple correlation, but you can maximize this intensity by wearing a weighted vest and having to work even harder – around 8% more calories are burned depending on your build and the weighted vest you’re wearing. Simple way to add resistance – Weighted vests are incredibly simple pieces of gym equipment and all it takes is the fastening of a few straps and then you’re ready to go. Better yet, they take up hardly any room and can easily be hung in a cupboard. These benefits make weighted vests popular with power sports such as football and rugby (particularly in the off season) to help increase speed and explosive power. Those involved with athletics can also find their performance boosted by weighted vests. The weight: It’s important that you study the weight of the vest on its own and how much weight it comes with. After all, everyone has a limit to their strength, so it’s crucial that you don’t purchase a vest which is too heavy for you. It may seem as though this will make you work harder and get stronger, but too much weight is more likely to cause you severe injuries. Adjustability: If you want to get your money’s worth out of a weighted vest then it’s vital that you purchase one which is adjustable. You’ll want to be able to adjust the weight of the vest for different exercises e.g. for a set of vertical jumps you can afford to go a little heavier than if you’re going on a 10km run. Size: Weighted vests are like people, they come in a variety of sizes. Therefore, you need to make sure that you buy a weighted vest which is right for your body. Sure, it may not seem as important as buying a suit which fits, but the truth is that a weighted vest which doesn’t fit correctly puts you at the risk of an injury due to the imbalance of weight. Material: Working out in a weighted vest can cause you to sweat a lot more than normal, so it’s essential that you buy a weighted vest which is made of good quality, sweat resistant material; this will allow you work out in comfort and not have to purchase a new weighted vest after a month or so due to stains etc. The 40lbs V-Force weight vest comes with a set of 2.5lb weights which can easily be added/removed to adjust the resistance you’re working with. The short design of this weighted vest ensures that weight is not directly on the stomach and allows you to work your core muscles with ease. The V-Force weight vest also offers two different shoulder widths: a narrow width for when you’re working with body weight and a wider width for running and walking. It makes for a weighted vest which is very secure, so there’s no risk of the vest becoming unbalanced and leading to a nasty injury. As well as being very comfortable, it’s also a very well designed and durable vest made from high quality materials, this means that it will last a long time and hold up to workout after workout. HumanX has designed a weight vest which can hold up to 20lbs of weight in 1lb increments to really help you increase resistance depending on your ability and the exercise you’re performing. An adjustable belt allows you to tension the belt to your specific needs and ensures that it’s suitable for a wide range of people. The outer shell of this weighted vest can stand up to all the exertion of a physical workout thanks to its abrasion-resistant design. What really stands out about this weighted vest is the ease with which the overall weight can be adjusted, the 1lb weights can be removed easily and quickly from the neoprene pockets built into the vest. 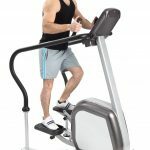 And whilst the vest may be made from a tough, durable material, it remains highly comfortable and allows you to work out without any irritations. Weighing in at a maximum capacity of 44lbs, this weighted vest is made from 1200d reinforced nylon and represents a heavy duty piece of kit from CFF. However, despite this weight and durability, it also comes with a significant level of comfort thanks to the lining and double padding. Using 2.2lb weights to crank up the weight, there are plenty of adjustments that can be made depending on your needs. Everything on this weighted vest is particularly snug, the weights fit into the pockets perfectly and will never be at risk at bouncing around and, with the adjustable Velcro belt at your disposal, the vest can be easily and quickly adjusted to a comfortable setting. And, thanks to the amount of weight on offer, the CFF weighted vest makes it the perfect option for endurance training and really lets you push your maximum capacity over time. With a one size fits all design, Box’s 45lb weighted vest offers a versatile opportunity to bring a whole new challenge to your workouts. Coming with 18x 2.5lb weights, this highly adjustable weighted vest not only allows it to be used by beginners through to advanced users, but also makes it perfect for almost any exercise you can think of. Constructed from a high quality material, the vest can be easily wiped clean after any workout and contours to a natural torso shape for comfort. The weight is nicely distributed across the front and back of the Box weighted vest, so this provides a pleasing level of balance and comfort, but, perhaps most importantly, also reduces the risk of an injury. Easily adjustable thanks to the innovative Box belt system, this weighted vest will give you a tight fit and is perfect for cardio work, with the added bonus that with the vest loaded to 45lbs, you will burn some serious calories. Made specifically for the female exercise addict, the Empower 8lb weighted vest is just perfect for those who are looking to add a bit of intensity to their workout and burn calories, but not build layer upon layer of muscle. Using pockets of sand sewn into the vest, the 8lb weight is evenly distributed across the front of back to deliver a comfortable and safe upgrade on your usual workout. And, with its stretchy, neoprene design, it will fit like a glove. Less intimidating than some of the more rugged vests available, this weighted vest from Empower is a hassle free piece of equipment that doesn’t require weights to be constantly loaded and unloaded. 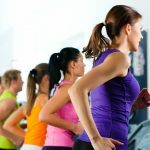 It’s the perfect weight to provide a noticeable difference when working out, but also won’t hinder you to the point that you struggle to complete your exercise. 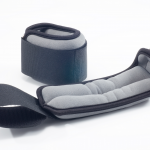 The adjustable tabs offer many different settings for tightness which helps make it suitable for almost any exercise. This weighted vest from SKLZ may have an ultra-compact design (which prevents weight banging against your stomach), but it still packs a punch in the challenge it offers your workouts. With 10lbs worth of weight evenly distributed across the vest, SKLZ have built a vest which is perfect for beginners and the actual weights themselves (made from sand) are highly flexible and move with you to provide a comfortable increase in intensity. It’s also a vest which provides a comfortable fit and won’t slide around on your upper body causing uncomfortable chafing, so there’s no risk of downtime and the accompanying delay between workouts. The adjustable nature is also a noticeable benefit with 1lb weight increments which are easy to install and remove depending on your needs. And, thanks to the high waist cut, it’s perfect for exercises which require a wide range of motion such as pullups and squats. 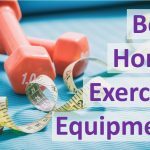 As weighted vests are such simple pieces of equipment, they can be easily incorporated into home exercise routines that include using a compact treadmill alongside numerous body weight exercises. Likewise, you may wish to complete a HIIT home workout and, by donning a weighted vest, you can really ratchet up the intensity of a body weight circuit taking in squats, lunges and press-ups. If you really want to burn some calories at the same time as building complete body strength, this weighted vest workout can really push you to your limit; it may make you sweat, but it’s the type of workout which produces an amazing rush of endorphins. It’s also possible to incorporate a weighted vest into a specific training regime for sport specific exercises such as baseball and football to help maximize speed and strength. Weighted vests are clearly an essential piece of fitness equipment and it’s not just because they can provide you with a new challenge that optimizes your fitness gains. What’s really special about a weighted vest is their versatility, so you can you use them in practically any sport or for any type of exercise – you can’t say that about a medicine ball, can you? You’ve probably got specific needs such as size, fitness level or even gender, so it’s crucial that you shop around to find a weighted vest which doesn’t compromise your fitness regime. By understanding what makes a good weighted vest, though, you should be able to pick the weighted vest which is right for you and start benefiting from it almost straight away. A weighted vest, however, can’t be described as the be all and end all of fitness though. 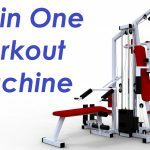 You may find that an all in one workout machine delivers everything that you need without the need for extra resistance. Or you may find that you prefer ankle weights when you need that little bit more resistance, so make sure you take a look at wide range of equipment to get the perfect fit for you.